This week, a team of paleontologists announced the discovery of a major new cache of Triassic-age fossils. They aren’t quite as stoked as they should be, though, because the fossils lie on the western edge of the former Bears Ears National Monument—land that President Donald Trump recently stripped of its protected status. “It’s completely ironic,” Society of Vertebrate Paleontology President David Polly told Earther, explaining that the fossil bed, which was first discovered in 2016, was one of the reasons the Obama administration drew the borders of Bears Ears the way it did. “It really is a reason this monument was created—these are scientifically important resources,” Polly continued. The fossil bed, whose existence was announced at the Western Association of Vertebrate Paleontologists conference in St. George, Utah this month, has only seen one small excavation so far, in September 2017. In the 70-yard patch they dug up, a team of paleontologists led by Rob Gay uncovered what appears to be a “massive assemblage of phytosaurs,” as he put it to Earther, including several intact phytosaur skulls. These crocodile-like creatures, which evolved alongside dinosaurs before going extinct toward the end of the Triassic, can tell us a lot about what environmental conditions were like during the rise of the dinosaurs. Pravusuchus, a specimen found at this site, is of particular interest, because its fossils are rare across the American West. The site is also exciting because, well, there are bones everywhere. 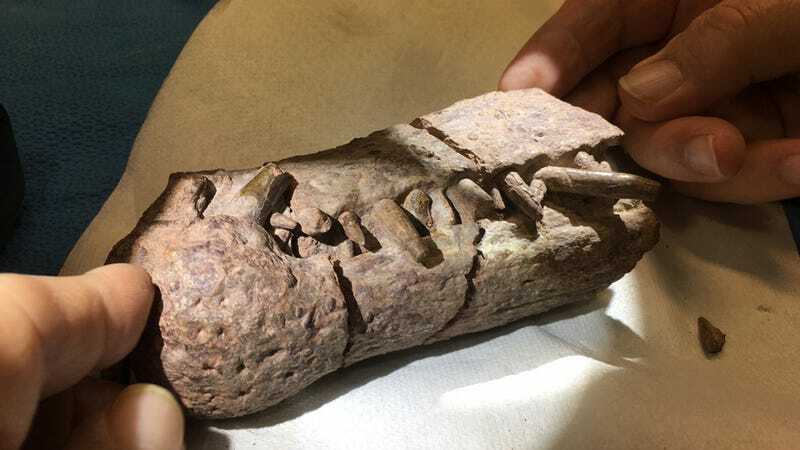 “It’s probably one of the largest and most dense Triassic bone beds in the country, certainly the largest in the state of Utah,” Gay said. Paleontologists were one of many groups to loudly decry Trump’s decision to shrink Bears Ears National Monument by 1.1 million acres back in December 2017. They’re even suing over it, and over the administration’s decision to scale down Grand Staircase-Escalante National Monument by 800,000 acres. Both sites are known paleontological treasure troves, and were designated as monuments with this in mind. That means paleontology has received special protection and additional funding streams at both sites. In fact, Gay’s initial excavation work done on this new Triassic fossil bed was accomplished with a Bureau of Land Management grant designated for use on for national conservation lands. As things currently stand, Gay doesn’t have funds to continue the excavation. And with the land’s protected status gone, there’s renewed concern about looting and destructive forms of land use, aka mining. As The Washington Post notes, these same sedimentary rock deposits also contain uranium that at least one energy firm may already be eyeing. Earther has reached out to the BLM for comment on whether it has any specific plans to continue protecting the fossil resources at this site, and we will update if and when we hear back. It’s unclear whether these new findings will have an impact on the ongoing legal challenges to Trump’s decision, which are expected to focus on whether a president can use the Antiquities Act to shrink a national monument. Polly noted that the courts have already been provided evidence on this site “and hundreds of others like it” in the areas Trump has excluded at both Bears Ears and Grand Staircase Escalante. At the very least, though, the new findings offer a reminder that Bears Ears National Monument was designated for good reason.